We are so pleased to inform you that the Meal Packing drive that was scheduled for January 27th went off very well and which would not have been possible without your tremendous support, whether by way of donations and/or volunteer help. It was overwhelming to see every one’s enthusiasm, generosity in giving their time and money in so much abundance. As a result of which, we packed almost 20,000 meals when we had originally set out for 10,000 as our goal, and then raising it to 14000 meals. Your generosity is going to go a long way! Please see attached a couple of group photos of the event and more photos will be posted on this ZAGBA website in a few days. Hope to do this event every year with all of your support again! THANK YOU! – REACHED OUR FINAL GOAL! !- ZAGBA Initiative – Thousands of Meals to be packed for families of hurricane victims! Dear Friends,We are so excited and pleased to inform you all that due to the generosity of yet another ZAGBA family who sent in a large donation received today, we have finally achieved our 2nd and Final Goal which was to fund 14,000 meals by raising $3500. A big THANK YOU to all our supporters who are making this event happen and so successfully at that. We are so excited that we can now achieve what we had set out for! To those who are still looking to send in their donations, please see our previous emails on this, with last one being sent on Jan 12. W e will put all the donations received to very good use by adding as many more meals as we can. As we work on this charity, we learn that t here is so much hunger around us and too many kids and families who go hungry everyday, and what we are doing here is minimal at best. Yet a great community effort that could not be achieved without your help. So thank you so very much! To all the Volunteers, you will receive an email soon with details on time, venue etc. ZAGBA SPONSORED EVENT COMMUNITY BUILDING EVENT!! This is a call for donations for a very good & noble cause, where in packaged meals will be delivered to feed the hungry. ZAGBA Board has once again decided to work with the ‘Outreach Program’ to sponsor packaged meals to the homes of Hurricane Florence victims to help them in a small way to re-build their lives. Our initiative last year for the victims of Puerto Rico was so well received, that we are once again encouraged to do a similar drive for hurricane hit families. We had announced this initiative on October 1st by email and also at the Jashan and Gahambar in October. Date: Sunday, January 27, 2019. Where: The Social Room, Chapel Hill East, 1500 Worcester Rd., Framingham, MA 01702. Time: 12:30 pm to 4:30 pm. (approx). What: ZAGBA volunteers will be packing at least 10,000 meals, and more if we raise more funds. This event is to help hurricane victims and is being run and independently sponsored by ZAGBA with the help of its community’s donations and volunteering physical help. The Outreach Program will be providing the food items to be packed with the equipment and supplies. Goal: ZAGBA has decided to raise $2500.00, which will sponsor 10,000 meals. One meal packet will feed 6 people. We hope we are able to raise more than $2500 in funds, so we can increase the number to 15000 meals. Let’s make this happen!! 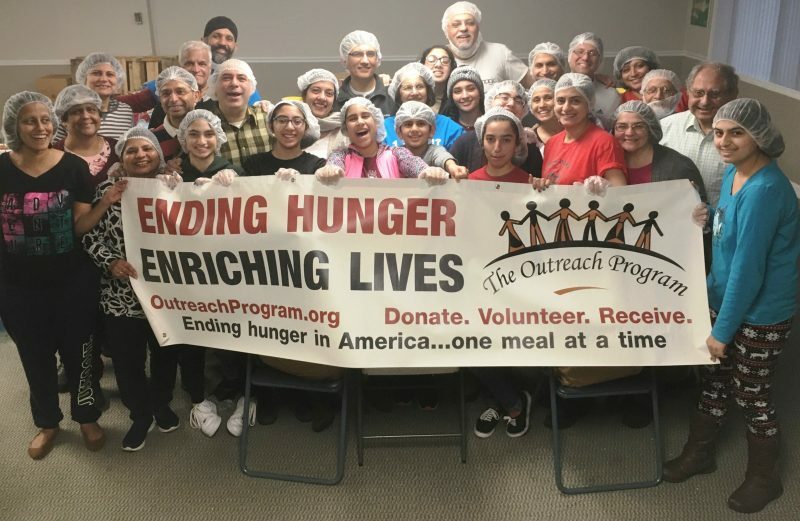 Volunteers Needed/Sign Up: In order to accomplish our meal packing goal, we will also need about 36 people to Volunteer (Adults and accompanied Kids, who are at least 7+ in age). Please sign up with Yasmin Bhumgara (her info is below) for the shift you want to volunteer in. You will need to be on time and be present to help on the date noted above. If your kids are younger, bring them and they can work with you (but please supervise them). This is an extremely gratifying and family friendly service to experience with friends. Please use PayPal and send payment to: treasurer.zagba@gmail.com in PayPal. There is NO fee charged to you for this. Go to paypal.com and login with your PayPal account. · In the text box enter treasurer.zagba@gmail.com . · Enter the amount and then Sending to a friend option. 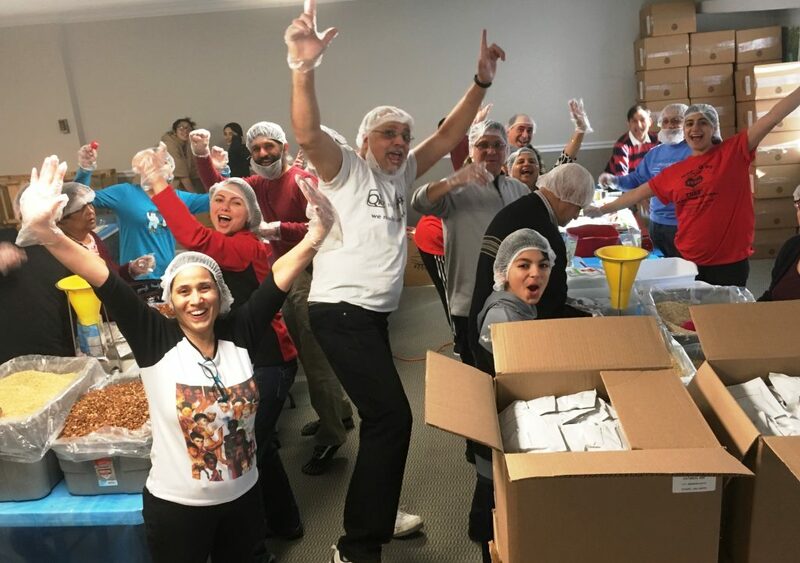 · Add a note explaining the donation is for: “Meal Packing Event-January 2019”. · Click Continue and choose How you want to pay. PayPal balance or Bank debit is better for you as you are not charged any fee in that case. · Click Next and then Send payment Now. That’s IT!! After you send your donation, please also inform Yasmin Bhumgara of your donation, as she is maintaining the list along with the ZAGBA treasurer, Pria Sarma. The Outreach Program feeds hundreds and thousands of families on an ongoing basis across the country, especially in disaster hit areas. ZAGBA requests your help/assistance in its drive to raise $2500. This is not a very large amount for our generous community, but will go a very long way to help the people hit by hurricanes who are still struggling to get back on their feet. Help ZAGBA in providing these nutritious meals. ‘Tis the season to give and we urge you to donate generously. Please keep in mind that this event on January 27th is hosted/organized/sponsored by ZAGBA, as explained above. Any questions, reach out directly to Yasmin Bhumgara by email: ybhumgara@gmail.com or text/call 781-858-1168. Thank you so much. Yasmin will look forward to your responses on Volunteering and donations.